When tracking the primary trend you are faced with a wide choice of moving averages. You can either copy someone else's, and hope that they have made an informed choice, or you can base your selection on the criteria below. Use a moving average that is roughly half the length of the cycle that you are tracking. If the peak-to-peak cycle length is roughly 250 days (1 year) then a 125 day moving average is appropriate. Cycle lengths do vary so you will probably be left with a choice of several different time periods. 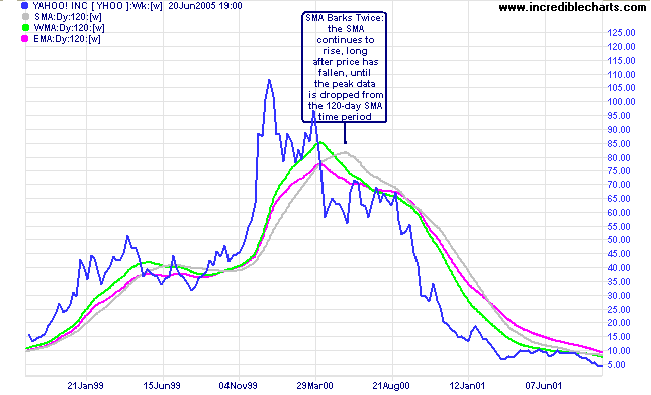 Plot a range of MAs against the price history of the chart and compare the results; then opt for the best fit. You have a choice of three types of moving average on Incredible Charts. What are the differences? Simple moving averages have a tendency to bark twice: giving one signal when data outside the normal range is added and the opposite signal when the same data is dropped from the moving average calculation (at the end of the time period). They should be avoided for this reason. You can also see, on the chart above, that the weighted moving average is more responsive than the exponential moving average: climbing higher and faster than the EMA during strong up-trends; falling faster and further during down-trends; and retracing quicker on reversals. On the chart below you can see that there is a significant discrepancy between the 120-day exponential moving average and weighted moving average. The 80-day exponential moving average is a closer fit than the 120-day EMA! In short, the SMA should be avoided and the weighted moving average time period increased (by roughly 50%) when compared to the exponential moving average. What is the difference between, say, a 30-week weighted moving average and its daily equivalent? Very little, if you look at the chart below. Weekly MAs are a legacy of the days prior to personal computers, when traders calculated MAs with their Texas Instruments calculator or even a Burroughs adding machine. Input data was kept to a minimum. get you out earlier, but give more premature exit signals (costing you money and raising your blood pressure). You have to decide what your primary objective is: to ride the trend until its end or to make a quick exit when the trend reverses. In a fast-moving trend or blow-off, you will want to use a faster moving average, like the 100-day EMA above. In a slow-moving trend, the slower moving average sometimes fares better, but you may be frequently stopped out with both of them. MAs are not suited to trading slow-moving trends: there are just too many false exit signals, whether you trade with a faster moving average or a slower one. Use a filter to exclude slow moving trends and then use a faster moving average on remaining (stronger) trends. No overlap (or a space) between the previous secondary high and the current secondary low (or vice versa in a down-trend). For more on spaces, see blind freddy trends. 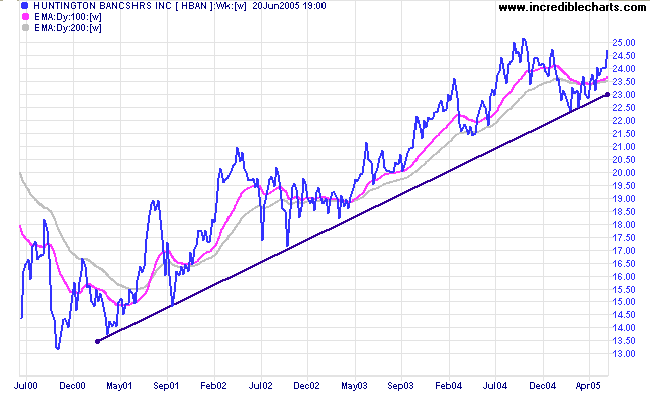 A secondary correction (or chart pattern) that respects the long-term moving average. Shorter-term corrections can be used, but the shorter the correction the greater the risk. 150-day WMA (if you are a creature of habit, a 30-week WMA won't make much difference). 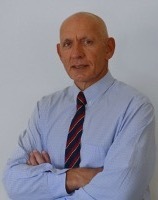 If you find that they are too responsive, then increase the time period until you achieve the desired result. Avoid using simple moving averages. 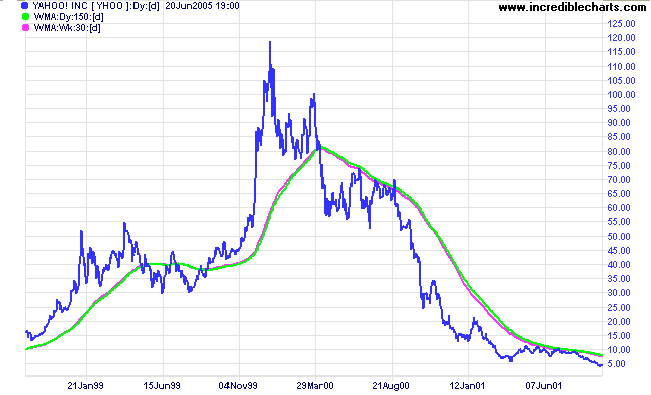 Beware that weighted moving averages are a lot more responsive than exponential MAs. 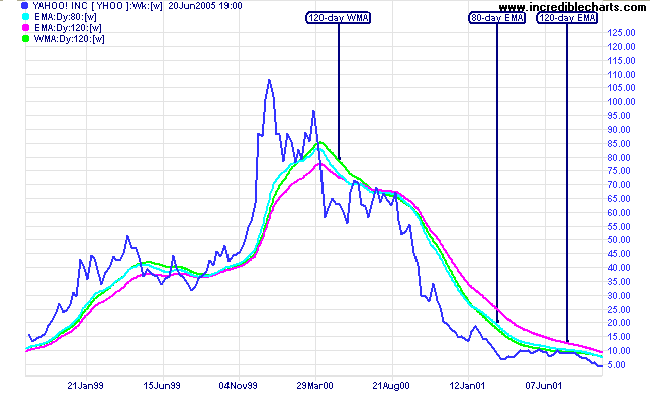 Avoid using long-term MAs on a slow-moving trend -- use a filter to identify them. 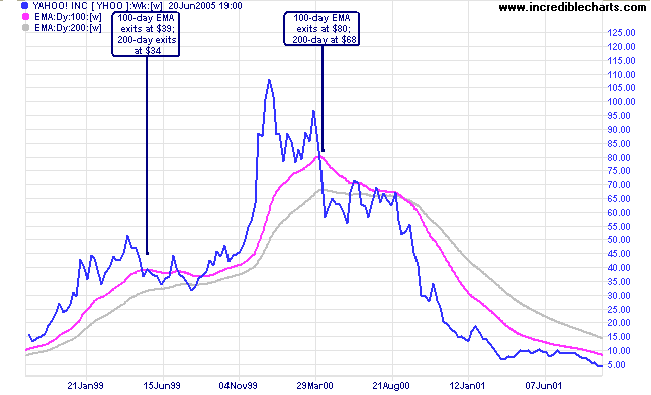 Try using a faster moving average (100-day EMA or 150-day weighted MA) on strong trends.